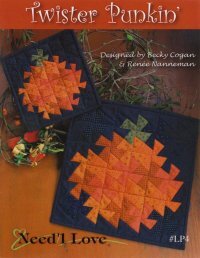 September 21st -- Free Motion Quilting, the Basics and Beyond with Wendy Fuller -- Take that quilt top make it your own. Wendy will teach you how in this hands-on class. September 23rd -- Twisted Punkin. Use the fun twister tool to make an adorable fall project. Kit includes everything you need including pattern, tool, pre-cut fabric, batting and backing. Just sit and sew! September 30th -- Paper Piecing. You asked and we delivered. Join Sue Pollack as she teaches you this fun technique. September 16th -- Sew a Jelly Roll Day. Come and join the fun as we have a Jelly Roll Race. We will teach you how to make an entire quilt top from your jelly roll. Bring your own or purchase one at the shop. Only 5 more seats available for a $5 fee. Also, a rousing game of Left, Right, Center. Winner will get a jelly roll! We will provide the jelly roll. Also, musical chairs jelly roll, with winner receiving a shop supplied jelly roll. Speaking of jelly rolls, have you been in the shop! There's over 45 new jelly rolls available. Fall Blocks of the Month! Mystery Quilt BOM -- $15 for an eight month program. It's pretty cool, and very clandestine because it's top secret!! Includes free bonus patterns. Begins soon. Only 4 more spots available. Winter Village -- Begins October 1 and you won't want to miss this one. She's a beauty and limited spots that are filling up fast. $28.95 for this 11 month program. Sign up soon!